Maui solar AC is a great way to save money and stay cool at the same time. If air conditioning is a large part of your electric bill, then Maui Solar AC will reduce it significantly. If most of your PV Air Conditioning usage is during the day, your energy savings can be 80% or more. The overall cost of you Maui Solar AC system will be very low, because you will be able to make use of the State of Hawaii’s 35% Solar Tax Credit and the Federal Governments 30% Solar Tax Credit. This can shorten your payback time to as little as 4 years. How Does Maui Solar AC Work? Maui Solar AC works by powering the ultra efficient AC compressor, with up to 90% of the energy being provided by the Solar Photovoltiac panels, during the day. We are often asked, “What if I already have Air Conditioning? 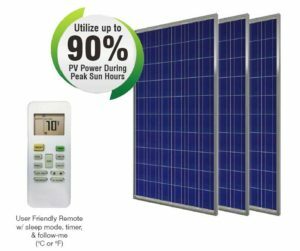 Can you add solar to my existing AC system?”. The answer is yes, we can. If you have a large investment in an existing AC system, even Central AC, we can power not only the AC, but everything else as well! And we can do it without batteries. During the day, the Solar PV panels will send energy to an inverter, which can power all of the circuits in your house. Whatever loads the solar cannot handle, your house will take the rest from MECO. We can do this under MECO’s Customer Self Supply (CSS) program. This method is actually better and will save you more off your electric bill than installing a dedicate Solar AC unit, mentioned on the left. This route does require permission from the utility, however, the application process only takes 4 weeks. If you add a one or more batteries, you can use the solar power at night too! With batteries, it is possible to lower your electric bill down to as little as $25-$30. In the last 2 years, the price of high quality Lithium-Ion batteries has plummeted, which is a good thing for the consumer. You should take advantage of this and install a Solar PV system now, while the State and Federal Solar Tax Credits are still available.